When we purchase a new trampoline for our backyard, we rarely consider the fact that it will most likely need maintenance and potentially repair at some point. 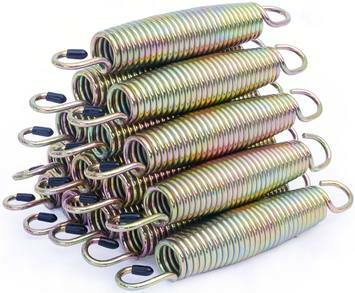 It's highly probable that some springs will need replacing, especially if you've enjoyed many hours of happy bouncing. You may think that this needs the expert eye of a professional, but this couldn't be further from the truth. 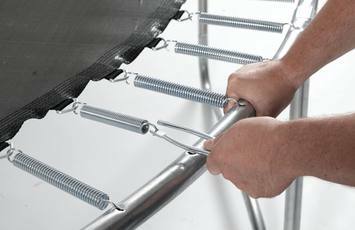 In fact, it's perfectly possible to replace springs on your trampoline yourself without breaking too much of a sweat. All you need is a little know-how. So, how is it done? Well, you'll need to know how to measure trampoline springs. Once you know your trampoline sizes, you can use our handy guide to help you. This article is crammed full of tips and information, so you can finish the job with confidence. 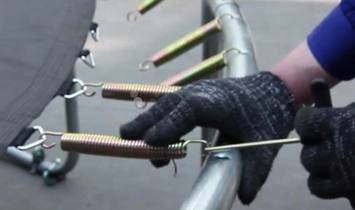 How many springs are on a 12-foot trampoline? How many springs are on a 14 ft trampoline? How many springs are on a 15ft trampoline? Where can I find trampoline springs for sale? 1. Remove 3-4 springs from the trampoline. You will need to measure several to check your measurements are accurate. This can be done by unhooking them with pliers. There is a possibility of springs pinging off, so it's not a bad idea to wear safety goggles and some gloves to protect from any sharp edges. 2. Lay the spring flat. Of course, it should not be under any tension at the time when you measure. If the spring has been stretched out of shape, you'll want to measure ones that are in good condition or your measurements will be too long. ​3. Measure the length of your springs. This means measuring right from the end of one hook to the other. 4. Turn your spring upright and, at the end, measure the diameter of the spring (from side to side of the circular end). Click here to find all spring sizes and latest prices no Amazon. Nowadays, you can readily purchase heavy duty trampoline springs. We think these are a great option, as they will provide extra strength and therefore will need replacing less often. Also, these springs are made from galvanised steel. This is a big bonus as they will resist rust when they get wet during rainy weather. Finally, these springs will resist cracking, which is a real risk during a cold snap. 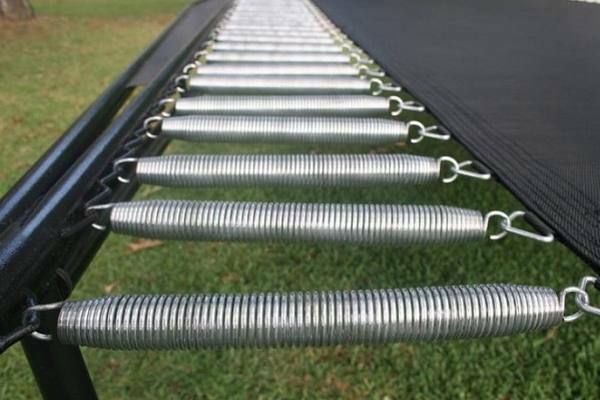 There is some variation between models when it comes to the number of springs on a trampoline. However, most 12 foot models have 72 springs. Usually, a 14 foot trampoline requires 96 springs. 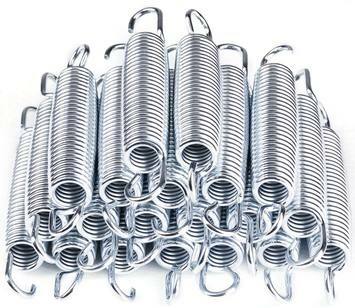 Like a 14 foot trampoline, a 15 footer most often has 96 springs. 1. Ensure the jump mat isn't under tension. While this may sound obvious, make sure your kids aren't sitting on it while you work, or the job will be a nightmare! 2. Protect yourself. Springs ping, and trampoline springs are no different! So, protective goggles are a great idea to guard against any mishaps if you have them. Also, trampoline springs can be rusty, rough, or have sharp edges. Thick protective gloves will protect your fingers from any nasty nicks or grazes. 3. Now you're ready to remove the springs, you have two options. First, you could use pliers to prise the spring hooks from the loops. While this is the most common method, it can be fiddly. 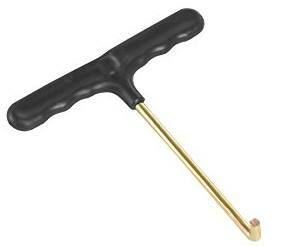 Otherwise, you can use a special spring removing tool. This leads us nicely on to our next important point. Some trampoline manufacturers now helpfully include a few spare springs with your purchase. If not, you'll need to buy replacement springs. In fact, we suggest investing in a few when you first buy your trampoline. Spare springs aren't that expensive, and it means that if you break a spring you won't have to wait to have new ones delivered before using your trampoline again. If you're worried that replacement springs will be difficult to track down, never fear. There are a wide variety available for purchase on Amazon in ever size you could possibly need. Hopefully, you now know all about trampoline spring sizes, how to measure trampoline springs and how to replace them. As you can see, this is not a difficult process and is a vital part of overall trampoline maintenance. Please remember to never, ever use a spring that has not been specially designed for use on a trampoline. While this may seem tempting if you don't have a proper one to hand, other types of springs are simply not designed to support body weight and will not be safe to use. Also, they won't provide that perfect bounce that a real trampoline spring offers. Now you know how to carry out this simple repair for yourself, you can look forward to many years of happy bouncing ahead of you. Click here to check trampoline springs latest prices.